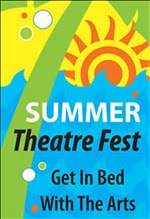 Mondays are actually not dark this summer; Theatre League member theatres are hosting free readings of plays by playwrights who are League members. Tonight, the Lost Girls Theatre is reading The Secret of the Biological Clock, written by Andi Arthur, CEO of the South Florida Theatre League. It happens at the Deering Estate tonight at 7:30pm. As you must know by now if you read The Scene, The South Florida Theatre League has built an entry for The Great Coconut Grove Bed Race, and this week you will find it at Florida International University's performance of 1,000 Years, a new play by Kenny Finkle, directed by Michael Yawney. It's part of their Alternative Theatre Festival. Gablestage just opened Good People, and The Miami Herald spoke with director Joe Adler about it last week. The Problem with "Donated Salaries." Broadway World tells us how the book series The Little Mouse Solomae makes its way from the children's library to the stage of The Roxy Performing Arts Center. Florida Theater On Stage talks with Marilyn Wick about the ongoing transformation of the old Caldwell space into The Wick Theater. Wick owns and operates Costume World, the world's largest supply house of theatrical costumes. Over the years, they've bought up their competition, acquiring actual Broadway inventory along the way. Those costumes will be on display in the museum she's building in what used to be the rehearsal hall. No mention is made about where they'll be rehearsing, but since the sets are coming in from Tampa (from what appears to be a graphic design firm), perhaps the scene shop. We wish them the best, because another professional theater producing large musicals is something we desperately need in South Florida. Time was, area actors could work a full year by working a circuit consisting of Actors' Playhouse, Jupiter Theatre, Florida Repertory Company, Hollywood Playhouse, the Ruth Foreman Theater, and The Royal Palm Dinner Theater. With only two theaters left on that circuit, we've lost a lot of talent to other markets. But we admit we have our doubts about the viability of this project; she's already on her third artistic director, and while she talks about "a quality experience", the music won't be played by a live orchestra. Top-tier theaters don't use pre-recorded music. That's like going to a fine dining restaurant and getting canned tomatoes on your salad. Broadway World fills us in on Madcat Theatre Company's next offering, Jessica Farr's Blow Me, featuring an all-star cast of South Florida favorites.